The power of music is profound. I do realize that statement is not so profound, but, sometimes, I forget how simple yet profound that concept of music as power can be. 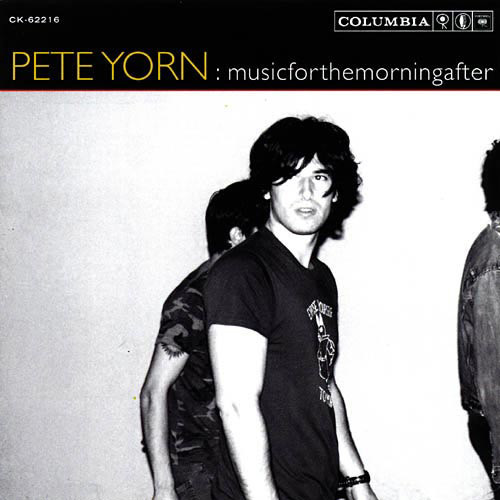 Pete Yorn’s debut album musicforthemorningafter is playing on my co-worker’s computer right now. She said she put it on, “In my honor,” remembering I was a fan. I forgot just how much of one I was. It actually originally struck me the other day when I was going through some old playlists to see what frame of mind I was in during, say, April 2008 or July 2004. “Long Way Down” came on, and I was surprised to actually feel something toward this piece of music I’d listened to a thousand times before. You could even say my heart grew three sizes that day. I can safely say there are few artists who have given me an actual reaction like that. There’s a little tug on the heartstrings, and I’m just going to come out with it: I get all gooey inside. Pete Yorn’s music is like a sigh of relief. The bounds of my idolatry are surprising even to me, so, in the way that only I can hyper over-analyze everything, I tried to dig deep into this shallow brain of mine and figure out why musicforthemorningafter is having this profound effect on me. The year was 2001. I was at the height of my film/music/pop-culture geekdom finishing up college at Temple University. Moving to Los Angeles to pursue film was finally in sight and, if I recall correctly, I was mega-crushing on a guy (HUGE surprise, I know). It’s always about a guy – or girl – isn’t it? It’s always about the love. More than anything, though, and I hope this doesn’t sound too cheesy, I think it was a super innocent time for me and one of the last ones, at that. Yorn was my answer to Jeff Buckley, who had died suddenly in 1997 when he drowned in the Mississippi River. With Buckley’s Grace I was wetting my tonal palette and really starting to come into my own with my musical tastes. Outside familial and peer influences were dropping away, and I was figuring out who I liked, not who other people wanted me to like, or who I wanted to like me so I started to like what they liked (don’t pretend you don’t know what I’m talking about). My musical tastes are varied, but the singer/songwriter – clearly – has established a nice chunk of real estate in my heart. Thank you, musicforthemorningafter, for reminding me of that fact.